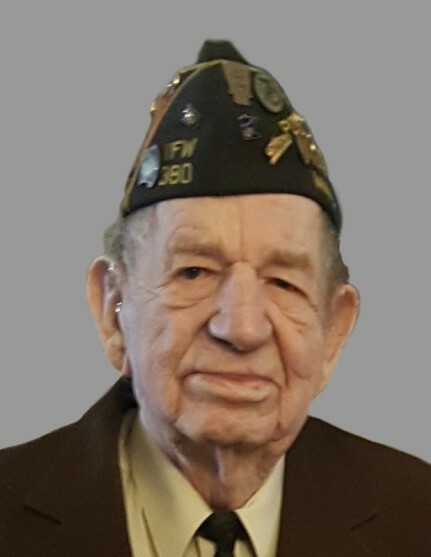 Raymond Kahnk, of Montevideo, died on Wednesday, November 14, 2018 at Home Front First in Montevideo at the age of 92. Memorial services will be held on Saturday, November 17, 2018 at 2:00 PM at Watson Lutheran Church in Watson. Pastor Linda Estling will officiate, and burial will be in the church cemetery. Visitation with the family will be held one hour prior to the services at the church on Saturday. Raymond William Kahnk was born March 10, 1926 in Ruthton, MN, the son of George and Marie (Kroeger) Kahnk. He was baptized and confirmed into the Lutheran faith. Ray was united in marriage with Selma Olson on June 23, 1952 in Dawson. They made their home on a farm near Watson where Ray farmed. After retiring from farming, Ray worked for a number of years as a custodian and handyman at the Montevideo VFW. Ray and Selma moved to Montevideo, and made their home at Eastgate Apartments for over 19 years. Selma, the love of his life, died on June 14, 2018. For the last month of his life, Ray made his home at Home Front First in Montevideo, where he made many new friends and captured the hearts of all the staff. Seven Kahnk brothers all served in various branches of the United States Armed Forces. Ray was a humble, but proud Army veteran of World War II, serving from January 1945 to November 1946. Ray was a past Post Commander and life member of the Montevideo VFW Post 380. Ray was also a member and past President of the Watson Lutheran Church. Ray enjoyed fishing, gardening, watching the Minnesota Twins, and spending time with his family, especially his grandchildren and great-grandchildren. He is survived by his three daughters: Susan (Tom) Anderson of Montevideo, Vickie (Ken) Wiesen of Sartell, and Debra (Bill) Monahan of Montevideo; seven grandchildren: Ted (Kristin) Anderson, Leanne (Tony) Stephens, Tara (Corey) Meisner, Aaron (Alli) Wiesen, Ryan (Lauren) Wiesen, Kristen Wiesen, and Shelby (Josh Moen) Monahan; fourteen great-grandchildren: Haylee, Emily, Alex, Rayann, Abby, Kenzie, Hannah, Connor, Joseph, Austin, Macy, Lexy, Blakely, and Benedict; sister Marian Fitzgerald of Northfield, and brother Louis Kahnk of Minneapolis; sister-in-law Muriel Pearson of Hadley; and several nieces and nephews. Preceding him in death were his parents; wife, Selma; two great-grandsons: Logan Ray Stephens and Dominic Michael Wiesen; brothers: Donald, Lester, Marvin, Harold, Richard, and Clifford; and a sister, Blanche.